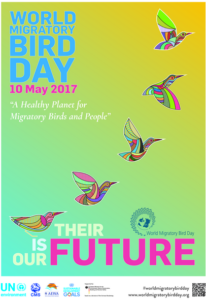 World Migratory Birds Day (WMBD) takes place every year in early May, to highlight the importance of supporting migration along flyways across the world. It is coordina ted by AEWA, the African Eurasian Waterbird Agreement (see links below). This year the date for WMBD is the 10th of May 2017. Many bird species migrate huge distances, and face many challenges, and these events raise awareness and inspire action to support their journeys. Migratory Birds for People is a network of wetland centres along the East Atlantic flyway, and includes members delivering wetland education and awareness-raising around important sites for birds and other wildlife. Connecting Schools and Birds will support local centres to run visits with school pupils and encourage them to explore their local wetlands, identify the migratory birds that they support and how their wetland plays a part in the flyway. MBP members and Wetland centres working with schools near or at wetlands. Wetland Link International coordinator will moderate. Coordination with AEWA’s communications team. Schools will be given a visit to the wetland in the week of the 8th to the 12th of May. The visit should include an introduction to the Schools and Birds event, the wetland centre and the wetland itself. Then spend some time in the wetland, looking for signs of birds (or birds themselves!) and exploring why the wetland is important for migratory birds. Our focal species is the Osprey, but any migratory birds will be useful. The pupils will be asked to prepare a short video (using a mobile phone or similar) which introduces themselves, their birds and the issues they face, based on the questions below. Each video should be around a minute long and will then be uploaded to the WLI / MBP webpages to be shared with other schools. For schools that are able and willing, we also invite them to take part in a video/skype conference call with other schools along the flyway. This will take place on the 11th of May. The registration deadline to be involved in the initiative is April 16th . Introduce yourselves, your wetland site and where you are on the flyway, maybe using a print out of the flyway map from the MBP pages. What did you do on site today? Why is your wetland important for birds? Which other countries / wetlands do the birds visit? What challenges do the birds face? How many kilometers do they travel each year? How can human beings help the birds to complete their amazing journeys? Identify another site that is taking part, and ask a question of the school there. Please contact the head of WLI, Chris Rostron, for more information at chris.rostron@wwt.org.uk if you are interested in joining this project.